“Wheels of Life” includes the work of two artists: June Glenn and Brescia Rose. They will be showcasing contemporary street photography centered on the current cultures of skateboarding and vintage cars in Santa Cruz County. Reception: First Friday, April 1 – 6-8 p.m. Nature seems cruel. A hunter has nothing but its teeth and claws to survive. There is nothing to protect the prey but it’s ability to hide. 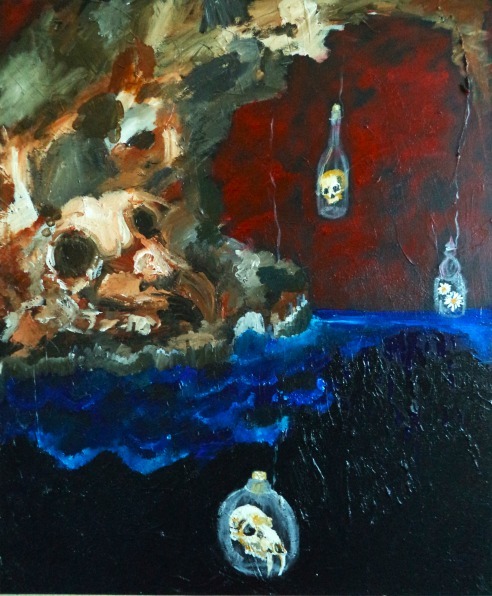 The artist’s goal with this show is to explore the darker side of the circle of life in this dog-eat-dog world. If you are not already tuned one of the best local music show in Santa Cruz, check out Local Brew on KZSC (88.1 FM) on Saturdays from 9 a.m. – Noon. If you have new music or upcoming shows to share, contact the show via their Facebook page or by emailing localbrew@kzsc.org. I am honored to have asked to participate on the music panel for Santa Cruz Speaks 2015, part of the 3rd annual Santa Cruz Music Festival. I’ll be talking about some untapped resources for musicians based on this top 5 list. Grants – a.k.a. – free money. A lot of musicians think “arts” grants are limited to the fine arts like painting, sculpture, etc. but there is a significant amount of grant money available to all artists, including musicians. If you have the motivation to apply, locally, check out the Arts Council Santa Cruz County, specifically their site for Grant Seekers. Musicians should check out the Develop Grants – for individual artists and arts organizations seeking support for their professional and business development activities. Guidelines here. Applications are accepted in Fall and Spring. The program is open to all Santa Cruz County artists. Example proposals: A pianist taking a technique class to help recover her playing ability after an injury, A visual artist creating a website to promote his work, An installation artist creating a Kickstarter video to fund their next project. Locally, also check out the Community Foundation of Santa Cruz County. Arts Council Associates – Arts Council Associates are a group of local artists and representatives of nonprofit arts and cultural organizations interested in mutual support, collaboration, and the promotion of arts events and programs. We meet every other month to chat, network, and catch-up, but also to share our challenges and triumphs, and figure out where partnerships can strengthen our community.They also co-produce the Gail Rich Awards each January, which celebrates local creatives and philanthropists who enrich our artistic community. Due are only $35 year. Event Santa Cruz – Event Santa Cruz is a monthly happening that showcases thriving local businesses, and the people behind them. Our events provide valuable (and fun!) networking opportunities, delicious bites and drinks from local vendors, and live shows by talented local musicians. If you’re interested in volunteering or speaking at our next event, or if you’d like to showcase your artistic or culinary talents for the Santa Cruz community, please contact Matthew Swinnerton at Matthew@EventSantaCruz.com. We’d love to have you at our next event! Balanced Breakfast San Jose – Balanced Breakfast is a music industry meet up, the local chapter to Santa Cruz is San Jose (currently over 900 members) – a group of Bay Area music industry professionals that meet every week to create community in our the music industry. Our topics change, but often relate to actions we can employ that will help the scene become a place where musicians & industry professionals can make money doing what they love. (Music). Next mtg. Sat. Oct. 17 from 10 a.m. – Noon – Rockbar. The Downtown Busker Fest – an ongoing series, on the 1st Saturday of each month in outdoor locations in Downtown Santa Cruz. The Downtown Association will promote the events and the individual performers, will provide access to posters and flyers for performers, and will arrange with the City of Santa Cruz for permits. Performers will receive a small stipend for their participation. Performers can accept gratuities during their performance time. SoundSwell – a streaming database of Santa Cruz local music that library cardholders can download for free. 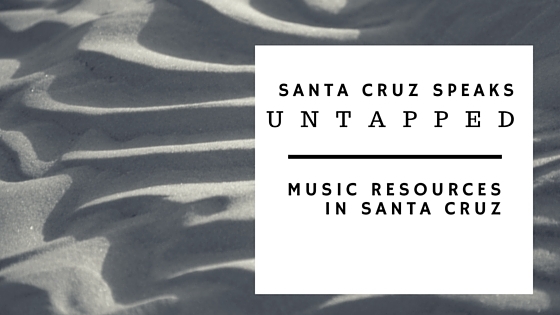 It was created through a partnership between the Santa Cruz Public Libraries and the Santa Cruz Rehearsal Studios and is growing to become a comprehensive discovery tool for finding local music as well as a robust historical archive of the local music scene in Santa Cruz County. Under the licensing agreement, the library will pay you for a 2 year non-exclusive license as follows: $100 for a full length LP consisting of 9 or more songs, $75 for an EP consisting of 6-8 songs, and $50 for an EP consisting of 4-5 songs. During the term of the license, only those users with a valid library card will be able to download licensed songs. If you meet the criteria and wish to submit your work, please review, fill out, and sign a license agreement form. If you have any questions or concerns or would like to meet in person to go over any aspect of the agreement prior to signing please email Project Manager Diane Cowen at VirtualServices@santacruzpl.org or call Library Administration at 831-427-7706. Monday, July 27 from 7-9 p.m. Nothing helps sell out a show like a good write up. 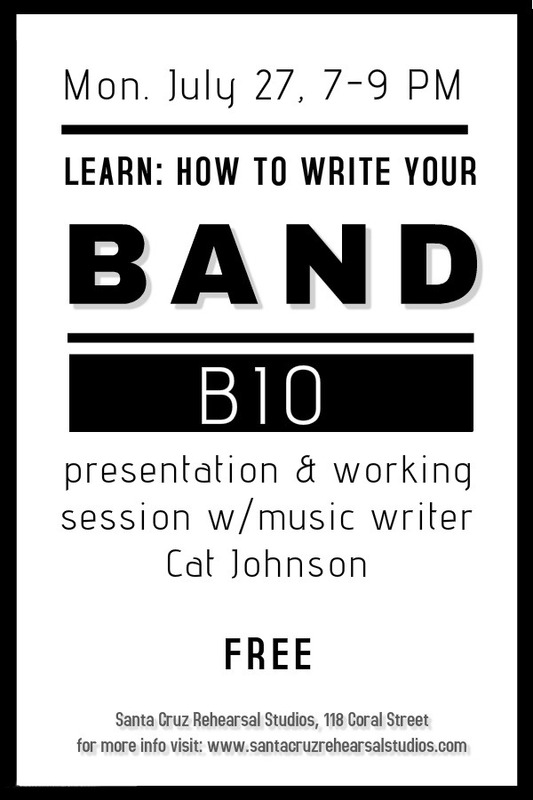 Come down and find out what a working music writer needs to write about your band. Presentation followed by Q&A and working session. Bring your current bio, laptop, notebook, or just a blank sheet of paper to finally start your band’s official bio. Cat Johnson is a freelance writer focused on music, community, and the commons. Publications include Utne Reader, GOOD, Yes! Magazine, Shareable, No Depression and Lifehacker. She blogs about freelancing, coworking, and thriving in the new economy at TheFreelanceCat.com. Artist Reception: Friday, June 5 – 6-8 p.m. The HOMEGROWN benefit brings together two stellar local bands to help raise awareness of the Santa Cruz Public Libraries Soundswell Local Music Collection. The SoundSwell project is one of kind in California, allowing library patrons to download and stream free local music with their library cards. This win/win project not only introduces Santa Cruz residents to their new favorite song, it also fairly compensates bands for their music and talent, and serves as a historical local music archive. A model for libraries across the country, our local library once again helps put Santa Cruz on the map as a forward thinking arts destination. Special Guest Emcee Kim Luke will be handing out great local raffle prizes too! 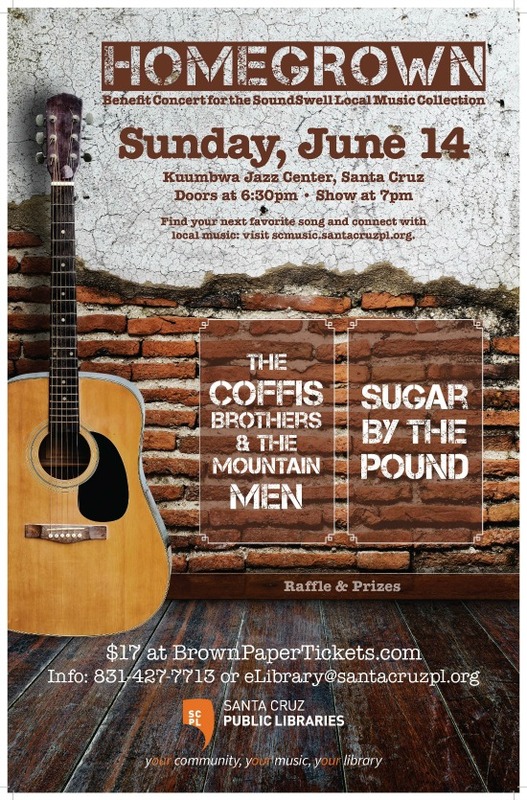 All proceeds from this event benefit the Santa Cruz Public Libraries SoundSwell Local Music Collection, a growing contemporary and historical local music archive that library cardholders can download for free. Tickets available at BrownPaperTickets.com.